The sight of solar photovoltaic (PV) panels on UK roofs is a more and more common sight these days, but how could your home benefit from solar panels and is it worth it? Solar PV is the most popular type of renewable technology delivering both cheaper energy bills and lower carbon emissions. They are cheaper than ever to install and are more energy efficient than ever. There’s simply never been a better time to embrace solar energy. Here are the 7 biggest solar panel benefits and how to get the best deal on your installation. By generating your own free energy you will need to buy less from your energy supplier and save money. The more of your own energy you can produce the less you will have to worry about rising energy prices. Many homes manage to reduce their electricity spend by as much as 40-50%. Solar panels will still produce energy even during the winter and on cloudy days, although they are obviously most effective during the summer. Adding a solar battery to your solar PV system can maximise your electricity savings even further. When your system generates more energy than you’re using it will send it back to the Grid. However, if you include a solar battery in your system, you can store this energy instead. This means you have access to free energy even when the sun isn’t shining so you can spend even less on energy bills. Who Makes the Best Solar Battery? Solar panel benefits aren’t just about money. Solar panels don’t produce carbon emissions as they work so can significantly reduce your home’s impact on the environment. When standard electricity is produced using fossil fuels like coal and natural gas it creates greenhouse gases which are harmful to our planet, so the more electricity we can generate from renewable sources, the better it is for all of us. If that weren’t enough motivation, eventually our fossil fuels will run out (some studies estimate this could be as soon as the next 30-60 years) while the sun is a permanent source of energy. It’s also more than powerful enough to do the job; if we could capture it, the sun produces enough energy in an hour to power the whole world for a year! You could also use your free solar energy to power an electric car which will simultaneously further reduce your carbon emissions and save you money on fuel costs. As solar panel benefits go, that’s a pretty big one! A small EV produces around 15 tonnes of CO2 from construction through to scrapping, compared to an average of 32 tonnes for the equivalent petrol or diesel car. The cost of charging your vehicle with electricity will also save you money compared to refuelling with petrol or diesel. According to our calculations, the average home could save up to £2,783 per year. Find out more about the potential savings of solar panels and an electric vehicle in our article Electric Vehicles & Solar Panels: Benefits & Savings. Your solar PV system will need to produce enough kWh to power both your home and car; we recommend that you contact a professional installer to find the right solution. Once the solar panels are installed there are no more running costs to worry about. Occasionally you’ll want to get your solar panels cleaned to make sure they’re getting as much sunlight as possible. If you have trees in your garden it’s worth making sure they’re not obstructing the panels. Aside from this, you don’t need to carry out any other maintenance. Most solar panels on the market today are covered by a 20-25 year manufacturer’s warranty so if anything technical were to go wrong, you can rest safe in the knowledge that it’ll be sorted out free of charge. Note: Your solar PV system will include an inverter which is the technology that converts the solar energy into electricity which can be used in your home. The inverter is usually covered by a warranty of 5-10 years so you will probably have to replace this at some point during the life of your system. Today most solar panels (in domestic installations) reach efficiency levels of 14-20% but this can rise to 22% for the best brands working at maximum efficiency. The efficiency of solar panels will be affected if they are shaded or located / angled incorrectly. For the biggest energy savings the panels should be installed on a south facing roof at an angle of around 30-45 degrees. Of course, the varied nature of British weather means it’s difficult to predict how much sunlight we will have and therefore how much energy the panels will generate. Solar panels don’t necessarily need direct sunlight in order to work, but they do need to be installed professionally, in the optimum location and at the correct angle to the sun. If your roof is overshadowed by trees or other buildings this will reduce the effectiveness of the panels. Does Temperature Affect Solar PV Panels? Will solar panels still work in the winter? Advancements in solar technology, increased demand and a more crowded marketplace mean that the price of solar panel installation has fallen considerably; it’s almost 50% cheaper to install a solar system today than it was 8 years ago. In 2011, the average cost of a 3.6 to 4 kW system would have been around £12,000. By the middle of June 2017, that cost was down to just under £6,500 on average with some systems installed for just over £4,000. Solar panel systems can be installed for as little as £2,000 with the largest systems costing up to £9,000. However, the price will be impacted by several factors including the size and type of panels used and the complexity of the installation. The average home with 3 or more people needs a 3kWh system which is approximately 12 panels. At a typical cost of £400 – £500 per panel, this totals £5,000 – £6,000. Most homes will have 12 or 16 panels in their system to meet their energy needs. While the cost of buying and installing a solar system isn’t cheap, it’s important to remember that you may be able to recoup at least some of your initial costs over time through energy bill savings. The cost of installing a solar PV system has dropped considerably in recent years and there are more manufacturers than ever offering competitive prices. When you consider that your system should last for as long as 25 years, it’s a great long term investment. Will solar panels increase the value of my home? Solar panels are large frames which are typically installed on your roof; they produce electricity for your home using energy from the sun. The most common types of solar panel are monocrystalline or polycrystalline, but you can also find thin film solar panels. Monocrystalline are made from single silicon crystals. They are usually black in colour and tend to be the most energy efficient type of solar PV panel. Polycrystalline panels use a combination of different silicon crystals melted together and have a blue appearance. Thin film solar panels are relatively new to the market and include a very thin layer of amorphous silicon which makes the panels thinner, more flexible and more effective in low light. They are usually cheaper than crystalline panels but not as efficient or widely tested. Solar PV Tiles As an alternative to fitting solar panels on top of your existing roof, it’s now possible to install solar PV tiles. They use the same technology as traditional solar panels, but are designed to blend in with your home’s architecture as part of the roof. Solar thermal panels are similar to solar PV panels, but rather than producing electricity for your home they use the sun’s energy to heat your water. Choosing the right type of solar PV panels for your home is not something you should tackle without professional advice. We recommend that you compare the advice and quotes from 3 different MCS approved installers in order to find the best solution at the right price. How Do Flat Roof Solar Panels Work? What Happens During Solar Installation? 1. Scaffolding may need to be set up so the installers can easily and safely access your roof. 2. Hooks and frames will be fitted onto the roof timbers which will hold a frame in place. 3. The solar panels will then be placed onto this frame with strong clips before electronically wiring the panels to the inverter. 4. The inverter converts the DC input from the panels into AC output for use in your home. The output is connected to both your electrical supplier and the National Grid. 5. Once they have completed all the relevant safety and quality checks your installer will provide you with all the documentation. Your installer should then register your system with the Microgeneration Certification Scheme (MCS). Solar PV panel installation – what’s involved? We recommend comparing quotes from at least 3 different installers to get the best price for your system. An installer should come to your home and inspect the project site in order to give you an accurate estimate of what a new solar installation is likely to cost. Once you’ve chosen an installer, they will create a plan for the installation before they begin the work. 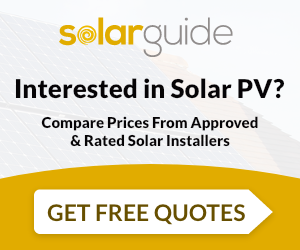 Solar Guide can put you in touch with up to 3 MCS registered installers in your area. Complete our simple enquiry form and we’ll be in touch to provide your free, no obligation quotes. What are the Best Solar Panels in 2019?